Making a baby blanket is a great way to welcome a new little one into your life. A blanket makes a custom gift that babies and new parents will treasure for many years to come. It's also the perfect project for an afternoon or evening sewing session. This adorable blanket involves machine applique and, if you choose, quilting. You can use the pattern to make a smaller, stroller-sized blanket or a larger version. This project is a great choice if you've got a little sewing experience, but you don't have to be an expert to take this on. It will take a couple of hours to complete. Click on the image of the pattern below to download it to your computer. The .pdf file will open in a new window or tab, and from there you can print it out. Choose the size of blanket you plan to make and print out the pattern accordingly. Cut out the pattern, and then cut out the fabric pieces. At this point you'll need to decide whether you want to create a quilted blanket or not. If you choose to create a quilted blanket, use flannel for the backing and also cut a piece of batting. If you won't be quilting, cut a piece of fleece instead. Cut the pieces for the mice out of flannel. Click to download the free pattern. Start by sewing the mouse ears. Place two ear pieces with their right sides together. Sew around the curved side with a 3/8 inch seam allowance, leaving the flat end open. Clip the curve, being careful not to clip through your stitches. Use the chopstick to help you turn the ear right side out. Repeat until you have six ears. 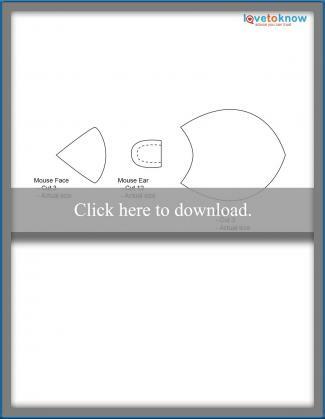 Pin a mouse head to a mouse body, positioning the ears within the seam. Sew a 1/4-inch seam to attach the head and body. Backstitch at each ear to make sure it is secure. Remove your pins and clip the curve of the seam. If your seam got off slightly, trim the fabric of the mouse body to give it a uniform curve. Use your iron to press the seam toward the body side and the ears forward toward the head. Repeat with the other two mice. Embroider eyes on each mouse using French knots. Paint the raw edges of each mouse with Fray Check and allow the fabric to dry. The Fray Check helps keep the edges from unraveling, since you won't be turning them under. Cut three pieces of black ribbon, each about four inches long. Trim one end at a 45-degree angle and leave the other end blunt. Position each mouse on the cotton fabric as you desire, and use pins to hold them in place. Slip the ribbon under the back end of the mouse bodies and hold them in place with pins. Using a zig-zag or satin stitch, applique each mouse to the cotton fabric. When you get to the ribbon tail, back stitch to make sure the ribbon is secure. Use embroidery floss to create the whiskers. Knot the floss about an inch from the end, then send your needle through from the front of the fabric at the nose of one mouse. Knot the floss again on the back and then come through to the front for the other set of whiskers. Knot the floss again and trim the end to one inch. Then embroider a nose. Repeat with the other two mice. If you'll be making a quilted blanket, stack all your layers together and pin in place with safety pins every four inches. Quilt around the mice, and then quilt the whole blanket in random wavy lines. If you won't be quilting, simply place the front of the blanket on top of the fleece back. Pin the binding around all four sides, lining the raw edges of the binding up with the raw edges of the blanket. Machine sew the binding in place, and then hand sew the binding to the back of the blanket using a slip stitch. Double check the security of each tail and ear to make sure your blanket is baby-safe. You're done! Consider choosing a darker color for the front of the blanket and making the mice out of white. Give them pink eyes and noses and gray whiskers. Keep your front fabric simple to allow the mice to stand out, but don't feel like you have to go with a baby-ish color. Bright colors can make your blanket seem more contemporary. For an alternative look, use pre-made or homemade satin blanket binding instead of a narrow quilt-style binding. Before quilting or attaching the binding, embroider baby's name or birth date on the blanket for a personalized touch. AllFreeSewing offers a free pattern for an heirloom-quality baby blanket. It has pretty satin binding and is appropriate for an intermediate-level seamstress. Craftsy has an adorable design for a giraffe lovey blanket. This pattern is half blanket and half stuffed animal, and it's perfect for beginners with a bit of previous experience. YouCanMakeThis.com has a free pattern for a simple receiving blanket. This is a great choice if you're new to sewing. Pretty Prudent has another simple design featuring quilt batting, flannel, and silky fabrics. It's a good option if you don't have a lot of previous sewing experience. Merriment Design offers a free pattern for a simple blanket with ribbon loops for baby to feel. You can also attach toys to the loops of this easy-to-sew and adorable option. If you love sewing for babies, a blanket makes an adorable project that's sure to get lots of use and appreciation. Have fun creating a sweet design that might even become a family heirloom.